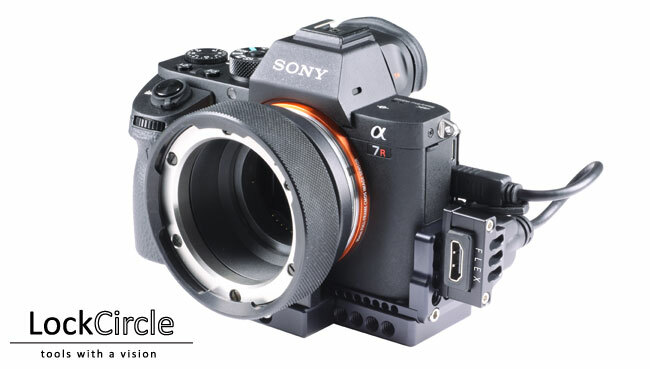 The innovative LockPort A7M2 by LockCircle protects definitely the fragile output on your Sony A7RII and A7SII cameras from tough production abuse and saves the "expensive to repair" mini HDMI port on your camera. Full-Size HDMI output, allows to use stronger standard cables, that locks into the socket with no signal loose! Innovative FLEX port (full-size HDMI) designed to work in Front/Rear, Top/Bottom HDMI Full-Size output, for the best layout cable set-up for drones, gimbals and rigs for your A7II camera. Full compatible with new BIRDCAGE PRO. The LockPort A7M2 has a Ultra-Thin baseplate designed to work like a "glove" wrapping around the camera body (can be mounted everywhere can be mounted the camera itself with all the original screws already used), a Side Plate with 20 mounting threads 1/4"-20, and a FLEX Port with a 4" cable (micro to full-size HDMI) including a titanium knob to mount the FLEX Port where is needed! The FLEX Port has a double sided reversible plate for best mounting integration. The T-Riser Baseplate upgrades the LockPort to a Micro Cage System, adding important features like a double camera thread, (offering rock solid mounting of the camera body in heavy-duty production applications) and 19 mounting 1/4"-20 threads for several accessory mounting. Front-Nose for Meta-Block for heavy duty Metabones mounting and IMS-Block for the P+S IMS Mounts System (Positive-Lock). better cable layout with drones, gimbals, rigs. Meta Block for rocksolid Metabones adapter (adjustable). IMS Block for P+S IMS Mount System (adjustable). made in Italy On delivery right now! Worldwide Delivery. All LockCircle products are available through the PS-Online Store (www.pstechnik.de) or contact our sales team by phone +49-(0)89-45098230 or email to sales@pstechnik.de.